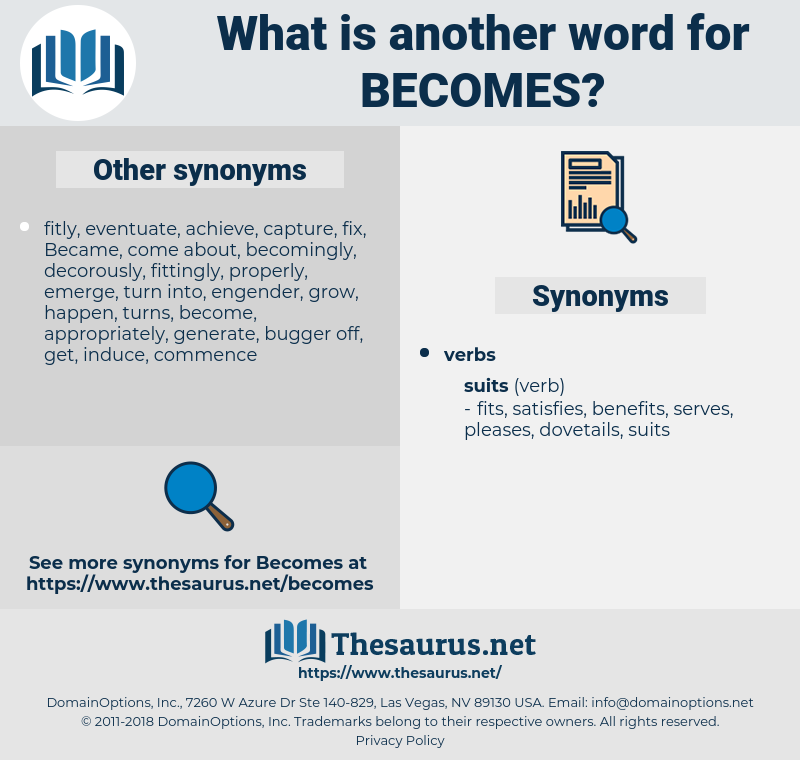 What is another word for becomes? 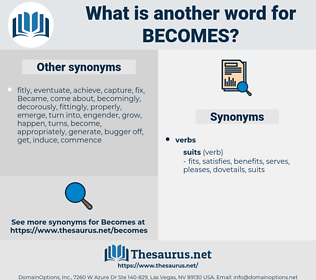 Became, LS, turns, Does, feels, looks, Was, Has, TSES, makes. increases, results, fades, levels, makes. Comes, communications, commences, participates, ec, contributes, constitutes, loses, commitment, incorporates, implementation, begins, assumes, exacerbates, moves, disappears, emerges, more, communication, acquisition, collects, ceases, comprises, joins, converts, submission, encompasses, exists, something, belongs, catches, destination, commands, transform, transforms, specific, capable, acquired, acquires, establishes, acknowledges, demonstrates, employs, turn, Manifests, Amongst, developments, performs, mentions, progresses, diminishes, corresponds, implements, reaffirms, develop, develops, subscribes, obtains, produces, knowledge, transitions, poses, system, evolves, seems, activates, Bears, transpires, development, considers, procures, processes, indicates, resembles, opens, Among, form, Forms, complies, creates, introduces, identify, between, announces, provide, observes, recovers, onwards, determine, determining, determines, improves, presents, issuing, represents, concludes, continues, grows, costs, offers, suggests, informs, accesses, rotates, exhibit, Leaves, enables, i.e., reverts, remains, therefore, causes, Affects, forfeits, coverage, receives, supports, accentuates, learns, teaches, indicators, decreases, helps, occurs, enhances, enter, enters, undergoes, Faces, contains, breeds, coincides, renders, promises, accepts, emphasizes, serves, recognises, proves, recognizes, ends, proceeds, promotes, suffers, illustrates, doubles, enjoys, outlines, achieves, entrance, touches, stops, nourishes, initiates, rises, understands, reinforces, uses, issuance, accedes, includes, maintains, Charges, execution, lowers, brings, earns, operates, notes, namely, Gains, switches, consists, surrender, surrenders, reflects, translates, depicts, follows, Addresses, reach, reaches, covers, knows, speaks, heightens, meets, amends, declines, transfers, concurs, places, Permits, purchases, expands, Recalls, endorses, matches, picks, sets, Exercises, changes, adds, breaks, fulfills, in, proposes, specifies, claims, involves, adopts, arises, feeds, regimes, fulfils, SITS, accrues, tells, grabs, retrieves, Towards, stipulates, highlights, Misses, finds, start, starts, regains, yields, works, reveals, undertakes, calls, leads, lays, reduces, adheres, raises, holds, spends, draws, lies, task, sweeps, sustains, target, targets, ready, arrives, incurs, revolves, entails, boosts, stays, attains, secures, expresses, displays, Carries, like, delivers, Travels, repeats, shows, decides, says, drains, seeks, returns, keeps, sends, needs, depends, restarts, Gives, nurtures, Rests, fails, underlines, POPS, satisfies, prepares, play, Plays, falls, amounts, allows, jumps, delivery, requires, lacks, agrees, Whenever, wins, drops, shifts, Anything, stands, buys, pays, fur, finishes, ask, asks, hears, acts, hits, extends, flows, senses, plus, guess, guesses, happens, loans, Drives, light, taking, takes, fires, visits, S, sees, regards, request, hinges, suits, Records, refers, deals, sure, Grants, rents, aligns, fits, 1998-99, passes, accounts, sounds, reads, relates, intends, Strikes, puts, lags, increases, wishes, spins, runs, results, thinks, 1998-1999, making, turns, Does, feels, looks, Has, makes. We don't care what becomes of it. Will you always stand that way and wait, until it'll becomes morning, noon, and evening? begum, beckon, bisayan, bozeman, Bewick's Swan, bos'n, bb gun, boson, bosun, bechuana, buckskin, besom, busman, begonia, beach wagon, beseem, buxom, bogeyman, bison, bignonia, backgammon, box in, bocconia, bassoon, boykinia, bo'sun, bakunin, bagman, bigamy, bikini, boogeyman, buchanan, Beach Waggon, bosom, bagnio, bosnia, biggin, buskin, Bookman, big game, begin, big gun, baggageman, bo's'n, beacon, beguine, bassine, bosomy, basin, bygone, big money, bossism, bosnian, biogeny, bacon, Bahaism, Bayesian, bushman, beechen.